(Lost Heritage Productions, 2004). Presented by Sandra White Hawk, including a conversation with Barry (Whitecap) Hambly (Carry the Kettle First Nation, Saskatchewan) and Dan Petrusich, producer. 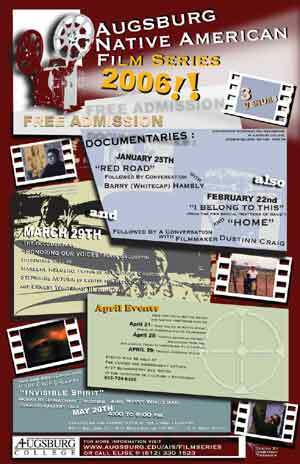 Red Road tells the story of Barry Hambly’s life in Canadian foster care, his adoption by the Hambly’s, and his search for his birth parents. This controversial and emotional story, told from Barry’s point-of-view, grew out of Barry’s desire to “write the story of his life” and his association with producer, Dan Petrusich. Tonight’s film will be presented by Sandra White Hawk, Director of First Nations Orphan Association, and include a video-cam interview with Barry Hambly and Dan Petrusich. I Belong to This (2003)–from the PBS special Matters of Race Home. Film Screenings will be followed by a video-cam conversation with filmmaker. I Belong to This is the final film in the 2003 PBS special Matters of Race. It is filmmaker Dustinn Craig’s personal look at culture and heritage. Dustinn Craig, a White Mountain Apache, lives in Tempe, Arizona with his wife Velma, a Navajo, and their four children. The couple considers what aspects of their cultural heritage they would like to pass on to their children. Home focuses on tribal members from a variety of tribes in Arizona and New Mexico, including Apache, O’odham, Pueblo, Yaqui who talk about what their land and the concept of home means to them. Honoring Our Voices (Judi Jeffrey, 1992). Film Screening will be followed by a panel discussion with Marlene Helgemo, Pastor at All Nations Indian Church; Ernest M. Whiteman III, Director of First Nations Film and Video, and Stephanie Autumn of Reducing Rural Violence. Honoring Our Voices is a short film about empowerment, healing, and tradition. Sharing their stories about recovery and healing, six Native women of different ages and backgrounds talk about the choices they have made to overcome the hardships of family violence and end the cycle of abuse and silence (Film synopsis). Our panelists: Marlene Helgemo, Ernest Whiteman III, and Stephanie Autumn bring their own stories, strategies, and wisdom to the conversation begun by the film. Hear Our Voices (Shawnee Seelye, Caroline Buckananga, and Cliff Bahma, 2005) 2:34 min— This short introduction by young Native Artists from the Four Directions Charter School sets the tone for the films by youth producers. The Spirit Within Us (LaShae Brooks, 2005) 4:13 minutes. The Spirit Within Us is a celebration of nature and LaShae’s life in Nett Lake Village. LaShae is a member of the Boise Forte Nation. A New day in A New Life (Nicole Auginash, 2005) 5:10 minutes. Nicole, also from Four Directions Charter School, portrays the point of view of her baby sister, who was born with heart problems and had to undergo surgery. dibishka bimaashid noodin: We Listen to Our Elders (The Students of Project Preserve, 2004) 3:04 minutes. This poetic mix of imagery and voice acts as an introduction to a longer set of interviews with elders from the Red Lake Nation. The location is Red Lake Highschool. Keepers of the Stronghold Dream (Tiana LaPointe, 2004) 12:19. Tiana’s video documentary examines the history of a massacre that took place in the Badlands of the Pine Ridge Reservation in the late 1800s. It is the beginning of a longer project Tiana is producing for the Lakota Nation. Maji-ishiwebizi Jibwaa-mino-ishiwebizi—“He Behaves Badly—Before He Behaves Well” (Students of Project Preserve, 2005) 20:40 minutes. This 20 minute film tells the story of a young man lost in alcoholism and rejected by his family. He finds his way back to his family and life through the love of his grandparents and sister. Undefeated (Tom Cain, 1995)—this is an older film but I show it in conjunction with the others we just saw from Red Lake. Tom Cain worked at Red Lake High School as a video instructor in 1995. This film about the basketball team is particularly telling of the sense of community and strength of Red Lake. The team won the championship the following year. Sunshine (Wenonah Wilms and Elizabeth Day, 2005) 7:32 minutes. This is a joint collaboration between writer Wenonah Wilms (Red Cliff Band of Lake Superior) and Elizabeth Day (Leech Lake). Elizabeth works with IFP Minnesota. Half of Anything (Jonathan S. Tomhave, 2005) 25 minutes. Jonathan is the second graduate of the Native Voices Graduate Documentary Program at the U of Washington. This film asks the question “What is a REAL Indian?” of four participants—Christina Entrekin, Sherman Alexie, Deborah Bassett, and John Trudell. Native American Voices I–Selections from the 6th Annual Fargo International Film Festival. Reservation War Parties, directed by Angelique Midthunder, Santa Fe, NM (13 minutes) WINNER Fargo International Film Festival’s best Native American Voices Narrative. Art and Video Exhibition Works by Jonathan Thunder and Missy Whiteman. Film Series sponsored in part by:The Circle Newspaper, (612) 722-3692; Independent Indigenous Film Minneapolis; Fargo International Film Festival; the Ho Chunk Nation; the Upper Sioux Community; and Augsburg College, including American Indian Studies, American Indian Student Services, The Augsburg Historical Society, Anne Pederson Women’s Resource Center, Women’s Studies.